A comedian dies on stage mid-performance and joins a small band of ghosts that inhabit the theatre. These ghosts are doomed to spend their afterlife within the building, but they don't have a lot to do (apart from attempting to scare audience members who can't see them anyway). They're a frustrated lot, and seem to all have backstories and motivations, but they haven't really worked out how to get along or communicate properly with each other. Until the latest death, that is: a game-changer of sorts that will help resolve everything that is wrong in their little world. 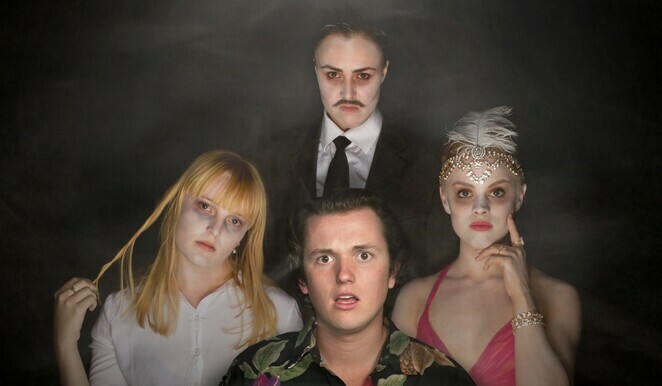 Tone Death: A Ghost Musical is a new work by Marshall & Marrows, running at The Butterfly Club from 8 - 21 April 2019 as part of the Melbourne International Comedy Festival. Marshall & Marrows made an impression with their previous work, Pining for Affection: A Tree Musical in 2018, and while this new show is built of similar parts (banter, music, and feel-good bonding between characters), it feels far less developed and lacking in substance. It has its moments: some good puns, lovely harmonies, engaging performances, and an interesting plot twist, but those are intermittent between unmotivated sequences of repetitive fretting and inaction, which makes the show feel somewhat lacklustre overall. The night I attended, one of the main cast members, Ursula Searle, was unwell, and her character Beth was played by show composer and musical director, Earl Marrows. This undoubtedly impacted the flow and effectiveness of the show, since Marrows understandably had a script in hand for most of the show, and has a significantly different vocal range to Searle (as they explained at the start of the show, she's a soprano, and he's a pianist). However, Marrows delivered a bright and energetic performance, complemented the choreography with improvised dance moves of his own, and I believe painted a fairly decent picture of his character's part in the story. The show's strengths were the costumes and makeup, the harmonies, and a surprisingly convincing antagonist, played by Jorja Polglase. Polglase's character promised excitement and answers, and was easily the most intriguing part of the show, but the script lets her down a little and her character's potential ultimately did not deliver, despite a good performance. Tone Death: A Ghost Musical is built on an interesting premise and comes from a team whose creative formula really worked for them in their last show. But the characters (and their world) could use a lot of development, the script could use tightening, and the plot could use refining before this show really meets its potential.